Spiritual Teachings of Swami Abhedananda has been gleaned and translated from the Bengali book, Patrasankalana (Collection of Letters of Swami Abhedananda) by Sri P. Sheshadri Aiyer, a disciple of Swami Brahmananda of the Ramakrishna Order. Shri Sheshadri Aiyer is a profound scholar as well as a devout Sadhaka. He is master of different languages, and has translated many books of a host of authors. Previously he translated into English the Sanskrit hymns composed by Swami Abhedananda and it was published from the publication department of the Ramakrishna Vedanta Math, Calcutta, under the title of "Songs Divine". His mode of translation is fascinating as well as lucid. We hope that this brochure will be appreciated by all, irrespective of caste, creed and colour. The teachings of Swami Abhedananda arc inspiring and living, and we fervently hope that they will guide all to the path of spiritual sadhana. 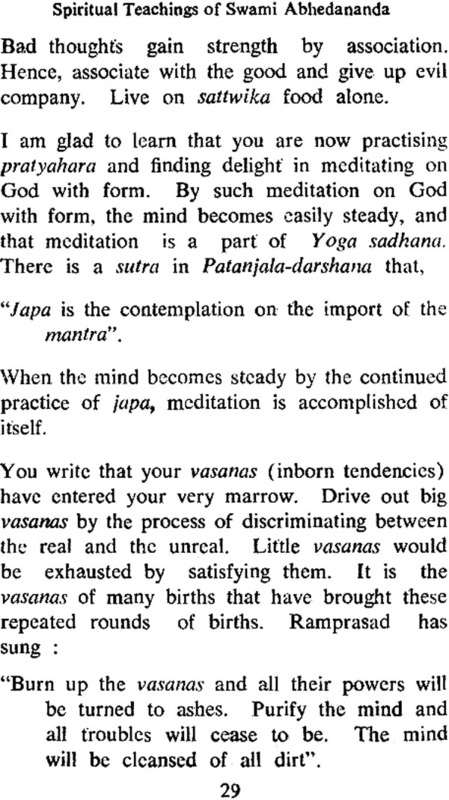 Introduction and glossary have been added by Swami Prajnanananda. In 1886, after the passing away of his beloved Master, Ramakrishna Paramahansa, Swami Abhedananda renounced the world and became a Sannyasin monk along with Swami Vivekananda and other spiritual brothers (gurubhais). He travelled bare-footed all over the sacred places of India. He became acquainted with Trailanganath Swami, Bhaskarananda Swami, Pawhari Baba and many other saints of India. He sailed from Calcutta to London in August, 1896. His first lecture in the West was before the Christo- Theosophical Society of London, on the Advaita Philosophy of Panchadasi. He met Prof. Max Muller and Prof. Paul Deussen of Keil University. In 1897, he crossed the Atlantic and landed at N~ York and took charge of the Vedanta Society at the request of Swami Vivekananda. In New York, he organised the Vedanta Society, delivering regular lectures on different aspects of Vedanta philosophy and religion. In America he gradually became acquainted with Profs. William James, Royace, Lanman, Shaler, Dr. Janes and others. He travelled extensively all through the United States, Canada, Alaska and Mexico. He delivered lectures on comparative philosophy and religion, based on the lives and teachings of the Saviours like Sri Krishna, Buddha, Zoroaster, Laotze, Christ, Mohammed, Sri Ramakrishna and others. In 1906 he once returned to India and delivered lectures on different subjects in different places of India and Ceylon and after going back to America devoted himself once more in preaching the Gospels of his Master, Sri Ramakrishna, along with those of other Saviours. He established several Vedanta Centres in America and trained many Western disciples in the sacred lore of holy India. In 1921 he sailed from San Fransisco and crossed the Pacific Ocean, breaking his voyage at Honolulu, to attend the Pan-Pacific Educational Conference, where he was a delegate from India. He next visited Japan, Shanghai, Hongkong, Canton, Manila and Singapore. From Singapore he' was invited to Kuala-Lumpur in Malay States and delivered series of lectures on Vedanta and Comparative Religion. From there he went to Rangoon and delivered many lectures and returned to Calcutta in 1921, September, after spending twenty-five years in America. In 1922 he went to Tibet and visited many Buddhist shrines and monastenes, including the Hemis in Ladak. There he came across a manuscript containing the unknown life of Jesus Christ who came to India. He translated portions of it with the help of a Buddhist Lama and published the same in his Bengali book. Kashmere O Tibbate in 1922. In 1923 he established the Ramakrishna Vedanta Society (now the Ramakrishna Vedanta Math) in Calcutta. He also established the Ramakrishna Vedanta Ashrama at Darjeeling in 192'4. He was the author of many books on philosophy, religion and culture, such as India and Her People (delivered serially in the Brooklyn Institute, New York, in 1905-1906), Reincarnation (1900), Spiritual Unfoldment (1902), Doctrine of Karma (1903), How to be. a Yogi (1903), Divine Heritage of Man (1903), Gospel of Ramakrishna (1905), Sayings of Ramakrishna (1910), Great Saviours of the World (1912), Human Affection and Divine Love (1912), Stotra-Ratnakara (Ocean of Hymns) in 1923 to name only a few. He left his mortal coil in 1939, September 8, in Calcutta. He also left many other valuable manuscripts on different subjects and after his demise, the publication department of the Ramakrishna Vedanta Math, Calcutta, published them one by one, under the titles of Path of Realisation (1940), Life Beyond Death (1944), Science of Psychic Phenomena (1946), Attitude oj Vedanta towards Religion (1947), Mystery of Death (1953), Philosophy and Religion (1951), Vedanta Philosophy (1959), Yoga Psychology (1960) etc. His monumental lectures on the Bhagavad Gita, (Synthesis of the Bhagavad Gila) was brought out in two separate volumes besides The Complete Works of Swami Abhedananda in eleven volumes, edited by his disciple Swami Prajnanananda, during 1967-69.